Gunner 65189 Arthur Murley Shelton, D Battery, CVII Brigade, Royal Field Artillery. Arthur was born in 1897 in the village of Beech near Alton, Hampshire, the second son of Arthur George Shelton and his wife Emily Sarah née Stockley. George and Emily were originally from Dorset and seem to have moved for work. George was a brick burner who moved to Newbury to take on the job of manager at the Clay Hill Tile and Brick works. The family lived in Clay Hill Villas, strictly speaking in Cold Ash rather than Newbury, but nevertheless within the scope of the town. The exact date of their move to Newbury is not known, but their fourth child, Florence, was born there in 1905. Arthur junior attended Speenhamland School in the north of Newbury, a mile or so from the family home. Finishing school, probably at the minimum age of twelve, Arthur then went to work at the brick works that his father managed. By the time of his enlistment, aged, he claimed, 19 years and 10 months on 18 January 1915 he was still working at the same works as a tile maker. He must have been very keen to serve, lying about his age to get in, only two months before he would have been eighteen and eligible anyway. He signed up in Newbury and was sent to the Royal Field Artillery, presumably he chose the RFA because his elder brother, William was already serving in that body. Following his training Arthur was posted to the 107th Brigade of the RFA, often shown as CVII Brigade, attached to 24 Division. He arrived in France on 8 September 1915, just in time to take part in the Battle of Loos. For over two years he served through many of the great battles on the Western Front. Mrs and Mrs Shelton, of Clay-hill, have three sons in the Army. Their second son [Arthur] has recently been home on leave after fifteen months in France. He joined soon after the outbreak of the war, and was in training at Basingstoke. The eldest [William] is also in France. Both of them belong to the Royal Field Artillery. The youngest [Sidney] is in the Royal Berks, and he is at present at Chiseldon. Arthur did manage to get some more leave, and used it to come home and marry his sweetheart, Maud Quin, on 5 January 1918 at the St John the Evangelist church in Newbury. In the spring of 1918 the British were hit by a series of ferocious German attacks that came perilously close to breaking through to the Channel ports and splitting the Allied forces in two. It was only by desperate fighting that the Germans were held, but not before they had overrun the British line from Ypres to the Somme. Arthur's division was caught up in this maelstrom just north of St Quentin. Their efforts to stop the Germans near the village of Le Verguier on 24/25 April earned them the gratitude of the villagers who named one of their few streets ‘Rue du la 24éme Division Britannique’. The British efforts prevented the Germans from reaching their target in this sector, the city of Arras, and the German high command shifted their focus north towards Belgium, but not before one last attempt to breakthrough on the Somme. On 4 April seventeen German divisions launched an attack toward Amiens that became known as the Battle of the Avre. By the following day the Germans had advanced over 12 miles towards their target, an enormous distance in the context of the war to date (over 30 miles since the start of the offensive on 23 April); however, wet weather favoured the defenders and the attacked petered out some 10 miles short of Amiens. Arthur was posted as missing in this battle; unsurprisingly men lost contact with their units as the Germans rapidly advanced over the British positions, many were captured, many others died, others got mixed up with other units finding themselves fighting in makeshift companies or platoons under whichever officer or NCO happened to be around. The survivors gradually made their way back to their units, but the dead and captured were all lost in German held territory. It was not until reports began to come in from soldiers who saw a comrade fall, or from the Red Cross reports of casualties and prisoners that an individual’s fate could be ascertained. Perhaps the worst cases were when there was no report at all, leaving the family living in what was usually a forlorn hope of his survival. Not having news from my husband for nearly a month I write to ask you if you could give me any information concerning him. My latest news of him was April 3rd. Since when I have not heard. He is Gunner A Shelton No 65189, D Sub, D Battery, RFA, 107th Brigade, 24th Division, BEF, France. Thank you sir for an answer. The sad news has reached Mrs Shelton, of Heatherlea, Wash Common, and also Mr and Mrs Shelton, of Clay Hill Villas, Shaw, that Gunner A M Shelton, No 65,189, was killed in action on April 4th, 1918. Letters received from his Captain, also the Chaplain and his chums, speak highly of the deceased, saying how much they all miss him. Gunner Shelton went to France in September, 1915, and he had seen much fighting. Mr and Mrs Shelton have also received the news that their third son, Sidney, has been missing since the 5th of April. Their eldest son, George, who was one of the Old Contemptibles, is still in France. He has taken part in a great many battles, and has seen much hard fighting. All three boys were employed at the Clay Hill Brick and Tile Works before the war. Arthur was buried in Moreuil Communal Cemetery Allied Extension, plot A33. 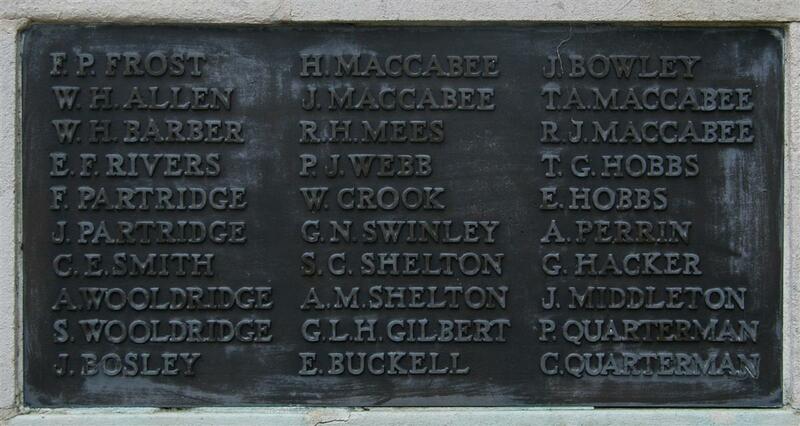 Locally his name is remembered on Panel 2 of the Newbury Town War Memorial as well as the Cold Ash War Memorial. His name was also on the Speenhamland School Memorial (now lost). Arthur’s elder brother William James George Shelton was to serve in the RFA throughout the war, one of the Old Contemptibles who was still in harness after more than four years at the front. He came home after the war and married Ellen Quin, elder sister of Arthur’s wife Maud, in 1919. He died in 1970 aged 76. The third brother, Sidney Charles Shelton, signed up in 1917 and went to the front with the Royal Berkshire Regiment. He died there, four days after his brother.